Our stainless steel cable chain heart medical id charm bracelet is cute, classic and stylish while keeping you safe. 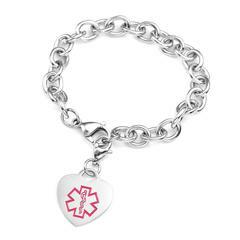 The heart charm is available with red filled medical emblem. Available in sizes 6, 6.5, 7.5 or 8 inch. The medical heart charm measures 3/4" x 3/4". Engraving is available with 3 lines 12 characters per line.